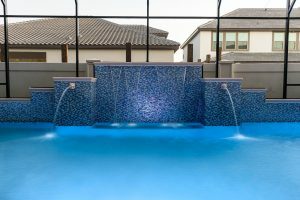 American Pools and Spas designs and builds swimming pools for clients in Orlando, Florida and surrounding communities. 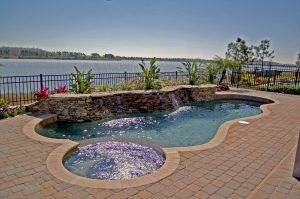 We have a design center located in Orlando to help make the process of deciding on features for your swimming pool. Learn more about our design center here. Before you purchase an in-ground swimming pool, you need to think about how your family will use it. Do they like to play a lot of water sports? Then maybe a play pool with sports set-ups is your answer. Do you like to swim laps? Perhaps a rectangular design is best for you. Or do you have a combination of swimmers and splashers? Concrete pools have the advantage of virtually unlimited shapes, sizes and designs. Whatever your preference, American Pools and Spas can create the swimming pool of your dreams today! their own backyard escape. If you want to build a pool , look through our pool design galleries. “At this time of thanksgiving, I wanted to thank two of your employees for doing an outstanding job. Crystal Lachendro and John Prano have gone out of their way to help me. Crystal in getting the pool completed with inspections and John helping me understand the new system. I worked in management for almost 38 years at a big utility in NY and know how top performers affect the company. In my opinion Crystal and John are excellent and I just wanted to let you know. Happy Thanksgiving and enjoy the holiday season. I love my new pool/hot tub/rock water spillover and two fountains. You did a great job and everyone who sees it loves the pool as much as I do." "I wanted to take just a moment of your time to express my gratitude for the job you and your staff has done for me and my family on my pool. From the first time I spoke to Janet all the way to the pool school I was treated with the utmost respect and kindness. All of your staff and subcontractors were very pleasant and courteous to work with. Every one of them went out of their way to explain each step of the pool and when they were done working for the day or for the stage they always asked me or my wife if we had any questions or concerns. Your superintendent Shawn made the whole thing come together. I will admit the thought of building a pool so far out had me a little nervous but everything Shawn told me was on schedule happened. It was without a doubt a very pleasant experience and I would highly recommend American pools to anyone. Please feel free to share this e-mail with whomever you wish"